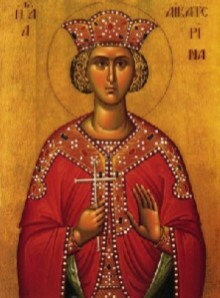 Saint Katherine, who was from Alexandria, was the daughter of Constas (or Cestus). She was an exceedingly beautiful maiden, most chaste, and illustrious in wealth, lineage, and learning. By her steadfast understanding, she utterly vanquished the passionate and unbridled soul of Maximinus, the tyrant of Alexandria; and by her eloquence, she stopped the mouths of the so-called philosophers who had been gathered to dispute with her. She was crowned with the crown of martyrdom in the year 305. Her holy relics were taken by Angels to the holy mountain of Sinai, where they were discovered many years later; the famous monastery of Saint Katherine was originally dedicated to the Holy Transfiguration of the Lord and the Burning Bush, but later was dedicated to Saint Katherine. According to the ancient usage, Saints Katherine and Mercurius were celebrated on the 24th of this month, whereas the holy Hieromartyrs Clement of Rome and Peter of Alexandria were celebrated on the 25th. The dates of the feasts of these Saints were interchanged at the request of the Church and Monastery of Mount Sinai, so that the festival of Saint Katherine, their patron, might be celebrated more festively together with the Apodosis of the Feast of the Entry of the Theotokos. The Slavic Churches, however, commemorate these Saints on their original dates. Today is the prelude of God’s good will and the heralding of the salvation of mankind. In the temple of God, the Virgin is presented openly, and she proclaimeth Christ unto all. To her, then, with a great voice let us cry aloud: Rejoice, O thou fulfilment of the Creator’s dispensation. Let us praise the all-lauded and noble bride of Christ, the godly Catherine, the guardian of Sinai and its defence, who is also our support and succour and our help; for with the Holy Spirit’s sword she hath silenced brilliantly the clever among the godless; and being crowned as a Martyr, she now doth ask great mercy for us all. Epistle Reading ~ The reading is from St. Paul’s Letter to the Galatians 3:23-29; 4:1-5. Nicholas John Bazos (1 yr) survived by his children Amy, Michael, Peter, Nicky and John Bazos. Panayiotis Pappas (1 yr) dear friend of the Atsidakos and Matthews families. Maria (6 days) remembered by her friends. Recently, I found myself reading, with great interest, from the PHILOKALIA, a truly spiritual book. As I contemplated its content, I realized that as we grow spiritually, we don’t change our thinking about our relationships with God and our fellow human beings. What happens is that we evolve spiritually in our relationship with God and as a result we EVOLVE spiritually in our relationships with our fellow human beings. Thank you! A big thank you to our guest choir director and organist, Judy Jimokas. General Assembly Mark your calendars. 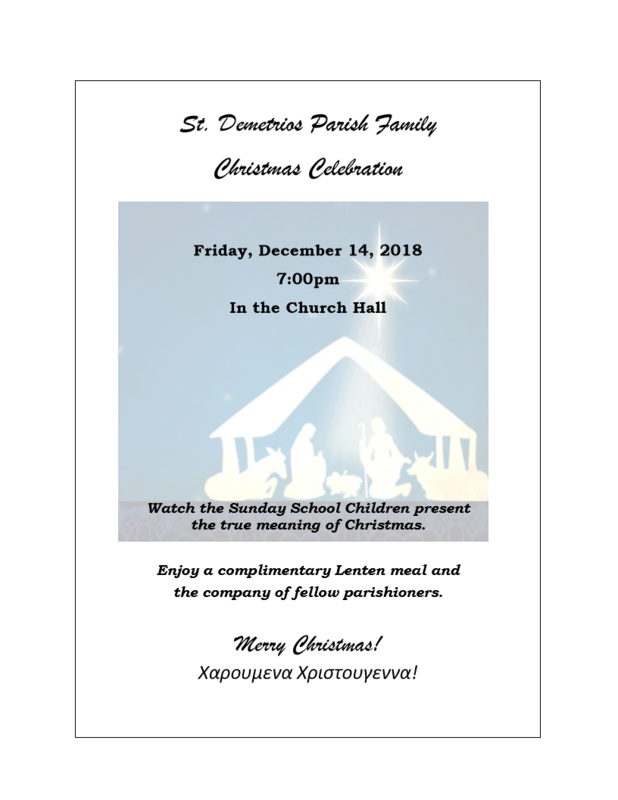 Sunday, December 2, 2018, in the Hall, directly after the Divine Liturgy. Christmas Poinsettias Donations towards the purchase of poinsettias would be greatly appreciated. Thank you. Philoptochos Thanksgiving Bake Sale ·· Last week’s bake sale was a success. Thank you to all who supported the many ministries of Philoptochos by baking or buying or both!